Sacramento, California - In response to the federal government’s recent decision to impose tariffs on steel and aluminum, China has ordered retaliatory tariffs on about $2 billion worth of U.S. food and agricultural exports, which could have a significant negative impact on California’s farmers and ranchers. China, the world’s most populous country, is an important and growing market for California’s agricultural exports. In 2016 alone, our farmers and ranchers sent $2 billion worth of products to the East Asian nation. The retaliatory tariffs increase the costs of U.S. exports, making our products less affordable for Chinese consumers. While other countries doing business in China will continue to enjoy lower tariffs, our farmers and ranchers will likely experience greater competition and a slowdown in sales. The tariffs will also have a chilling effect on the substantial growth that California’s agricultural exports–including wine–have experienced in China throughout the past decade. Future trade opportunities could be lost as it becomes more difficult for our producers to secure and grow new Chinese markets. 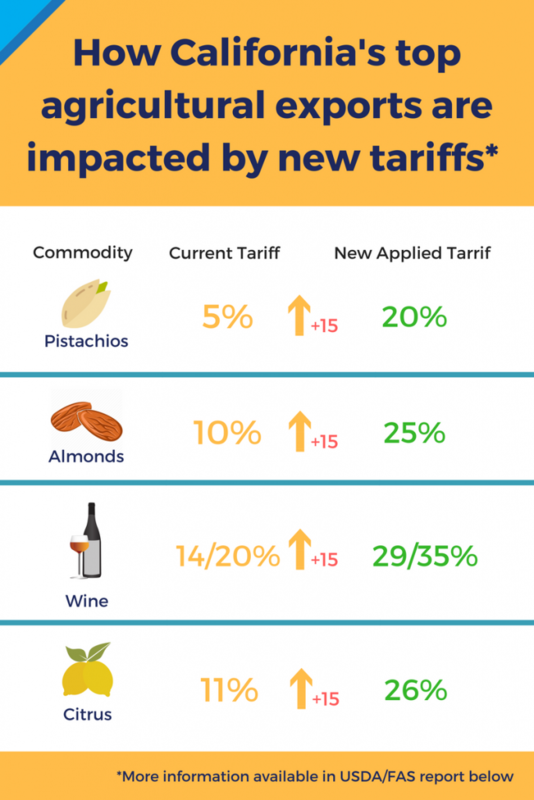 The increased tariffs impact four of California’s top five agricultural exports to China, including pistachios, almonds, wine, and oranges and orange products. These four commodities accounted for $1.34 billion worth of exports to China in 2016. In addition, the new tariffs target nine of California’s top 10 fruit and nut commodities (by overall international export value). The list includes wine, walnuts, pistachios, table grapes, oranges, strawberries, raisins, lemons and dried plums.